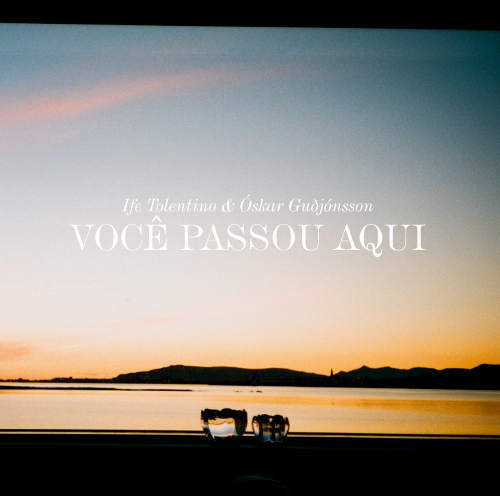 Brazilian guitarist and singer Ife Tolentino waited eight months to launch his album Você Passou Aqui (You Were Here) in the UK because he wanted to launch it at The Vortex, and The Vortex is always busy so he had to wait. Such loving attention to detail distinguishes this album of standards and compositions from more familiar Brazilian music. You think you know what Bossa Nova sounds like, but this album has something else. It has a fragility which hints at its inspiration – Iceland, land of ice and fire, but also of tiny alpine flowers, midnight sun, silent landscapes, which contrasts so powerfully with the fecundity of the Brazilian landscape of lush forest, beaches and exotic blooms and flamboyant carnivals. The album was recorded in Iceland with the Icelandic musicians listed below. It consists of standards like S’wonderful (which sounds as if it had been written by Jobim, not Gershwin), compositions by Jobim himself and own compositions. Especially beautiful is Me Chama (Call me) which has a haunting refrain which prompts me to reflect on the fragility of life in Iceland, where short days, tiny population and possible volcanic extinction make for a very thoughtful approach to life where you savour life’s beauties, especially if they are fleeting. The lyrics are poetic, sparce and beautiful. All the musicians are caught in the spell, tiny cameos such as the sax on Como num Conto, sparkle like stars. At The Vortex, Ife was joined by Liam Noble on piano and Julian Siegel on saxophone. Ife’s vocals are unhurried, intimate like conversation, he makes it sound very easy and natural. The languor was reflected in Liam Noble’s sparce piano accompaniment, his fingers barely spanning a few keys yet sometimes delicately skittering or bubbling like lava. In Teco Teco Julian Siegel had no difficulty shadowing Ife’s tongue-twisting lyrics and speed, like dancing on coals. I do not speak Portuguese so to me most of the compositions sounded sunny but reading the sleeve notes I see this is misplaced. Many are sad, lonely and wistful. But George Harrison’s Here Comes the Sun reminded us that album launches are joyful times. It was a special evening and it’s a lovely, gentle, thoughtful album by a very accomplished singer guitarist.